My Book A Day: New Book by Cami Checketts! New Book by Cami Checketts! Find Stone Cold Sparks on Amazon, free for KU members. A stone cold firefighter, lifelong secrets, and the vivacious woman who won’t give up. Abi Newell is feisty, fun, and beautiful, and has date offers every night of the week, but she gave her heart away to Stone Ryland when they were teenagers and that was the stupidest decision of her life. Though Stone is the perfect fit for her—kind, patient, and steady—he’s also shut himself off to everyone, including her. She’s accomplished best-friend status with her dream man, but winning his heart is a quest she may never win. 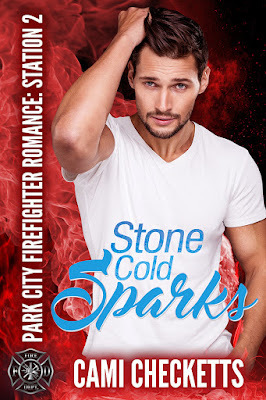 Stone has been deemed Stone Cold by his firefighting buddies for good reason—he has the remarkable ability to put his feelings on the shelf while dispassionately dealing with the situation at hand. Too bad Stone’s buddies don’t know the truth. A truth Stone will fight tooth and nail to keep hidden. Abi is his one weakness, but Stone can’t let anyone into his heart or his well-protected secrets will be discovered and run the risk of destroying not only Abi, but his deceased wife’s memory as well. Can Abi break through the ice surrounding Stone Cold’s heart, or will she be forced to give up on her lifelong love? I love Cold Stone ice cream and thought it was the perfect tie-in to my Stone Cold hero. Enter below to win a $25 gift card. Happy reading and ice cream eating!